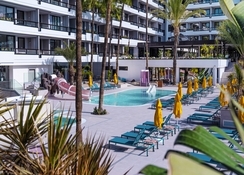 The seaside Spring Hotel Bitacora is a firm family favourite boasting a first class location just five minutes’ stroll from a golden sandy beach, and close to the vibrant tourist hub of Playa de las Américas. You couldn't ask for more to keep the whole family happy, including two lovely, lagoon-style pools, with one where kids can zoom down thrilling water slides. It has a great buffet restaurant, an awesome adventure playground and a popular kids mini club. 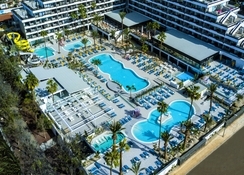 The hotel, surrounded by lush gardens, has 314 rooms with balconies offering stunning views of the Tenerife landscape and coast. If you can bear to leave the poolside, there are plenty of shops, restaurants and bars to discover nearby. 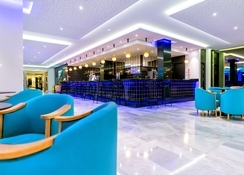 Spring Hotel Bitacora is located 16.4km from the Tenerife Airport, about 30 minutes by coach transfer, and just 15 minutes from the buzzing centre of nearby Playa de las Americas. The beach is 800 metres, little more than 5 minutes' walk, from the hotel. Spring Hotel Bitacora features 314 rooms, which can accommodate up to three adults and one child. Its categories include Standard Rooms and Pool View Rooms, that come with their own balcony or terrace. 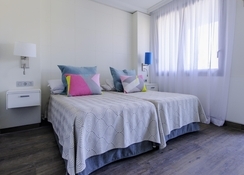 All rooms come with a hairdryer, air conditioning, 32" flat screen TV with satellite, pool towels, bathrobes and slippers, free fridge (drinks not included), tea and coffee making facilities, safety box and a weekly breakfast delivered to your room. You can have your meals buffet-style in the main restaurant, alongside cocktails and beers, with snacks and ice creams also on the menu. 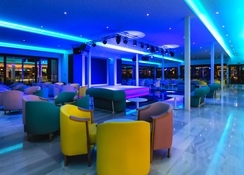 The Music Hall Bar, open in the evening till midnight, hosts live music and popular, international acts. The La Palapa Beach Bar is located conveniently near the pool, offering a selection of tapas and an a la carte menu. 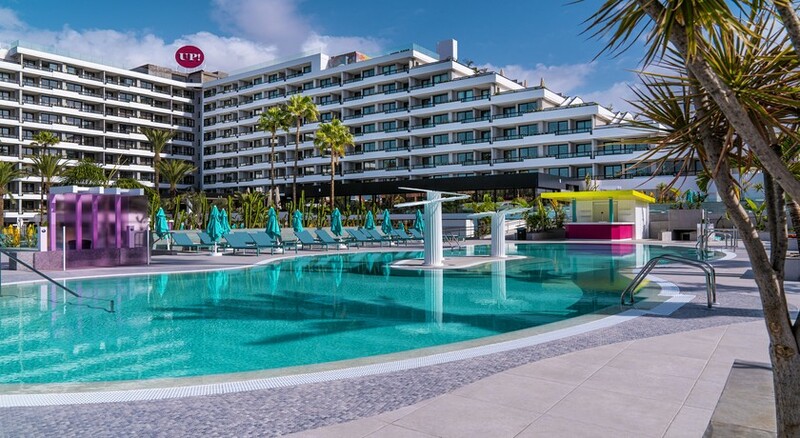 Soak up the sun at the two lagoon-style outdoor swimming pools, where parasols and sunbeds are provided. Have fun on the waterslides with the kids or check them into the mini club which has games and activities on tap for ages 4-12. There’s an adventure playground with swings and slides at Spring Hotel Bitacora and a soft play area with ball pit for the younger kids. If you like entertainment there are live shows each evening, or try your skills at mini football, basketball, hockey, billiards and darts. 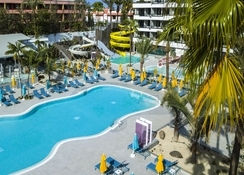 The beach is just over 5 minutes' walk away and the city centre of Playa de las Americas, with its host of entertainment options is close by as well. The Las Americas Golf Course is about a kilometre away.